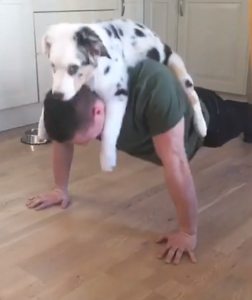 Buff Guy Gets Work Out Help From Cutest Personal Trainer Ever! In the harried activities of our daily lives, it’s often hard to ensure our four-legged friends are getting their daily doses of exercise. And that’s especially important for members of the herding group, who need lots of walks, runs, and games of fetch to burn off all that energy. Neglect their exercise needs at your own peril. 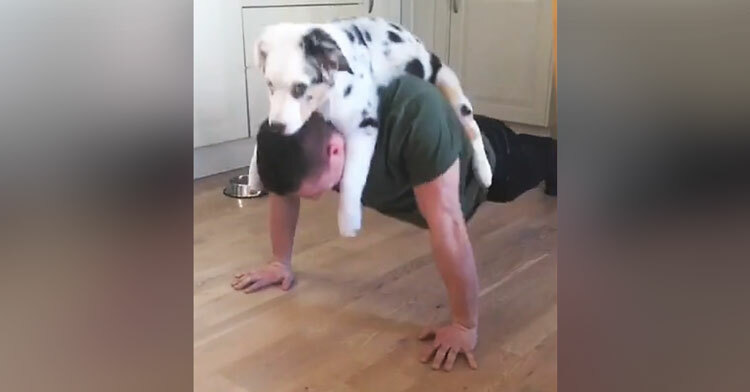 So the next time you’re heading off to the gym, your pup’s sad gaze weighing as heavily on your shoulders as a 100-lb. 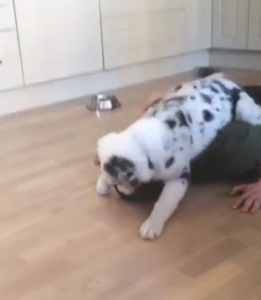 barbell, think back to this video, starring Tyr and his girlfriend Patricia’s Australian shepherd puppy, Atlas. Atlas has all the energy of a puppy his age, and with those high-drive shepherd genes coursing through his veins, he loves nothing more than to live and work alongside his people. 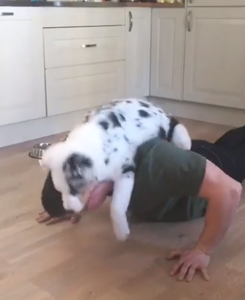 So, of course, he’s totally game when Tyr decides to incorporate the speckled little fuzz ball into his daily workout routines. Drop and give me 10! No, three sets of 10! We’re not making judgments here or anything, but we highly doubt your workout buddy is as cute or inspirational as young Atlas here. Watch his unique motivational techniques in the clip below, and be sure to share with your own workout buddy today!